There is a free monthly online webinar exploring different ways of using Xerte Toolkits in different subject areas or different pedagogical contexts. These webinars are organised by Jisc TechDis as part of their support for the University of Nottingham's pioneering work in bringing accessible e-learning to all. 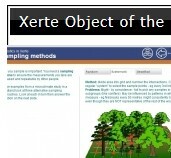 Xerte Online Toolkits (XOT) has many benefits for teaching and learning. These are summarised below. 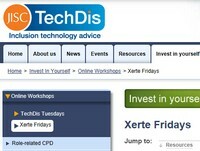 Xerte toolkits enables teachers with limited IT experience to create rich and interactive Web resources for learners. By being web-based, learners can access the resource out of lessons / lectures. This supports learners by giving them any time/anyplace access to your resources. If Internet availability is limited, any learning objects you create can be exported for local use via USB sticks or CD-ROMs. Xerte toolkits contains a wide range of templates. Many have been developed in response to specific teaching needs. A range of interactive page types gives teachers opportunities to be creative with the presentation of material and informal self assessment opportunities. It is easy to embed audio, images and multimedia for rich learning. You can also link to your existing resources or embed your favourite webpages within the Xerte toolkits. This gives enormous flexibility. As you create learning objects, table of contents and navigation buttons are automatically available from every page so different learners can easily pick different route ways through the resources. You can set up RSS feeds from your Xerte toolkits folders, allowing learners to subscribe to learning objects. This gives them instant notification and access as soon as you have created a new learning object. Tutors can collaborate on learning objects, easily adapting one another’s resources to suit different learners or courses. For example a statistics module for psychologists could be easily and rapidly adapted for biologists. Xerte toolkits has been designed with disabled learners in mind. Accessibility improvements are ongoing and – being open source – organisations with the expertise can adapt it to specific learner needs or even create new template types. See more in the Accessibility section. Training resources are available online (see resources section) and JISC TechDis provide free online training session is available on the last Friday of every month during school terms (Xerte Friday training sessions). Xerte toolkits is ideal for Interactive Whiteboards and integrates well with Moodle. Xete Toolkits is a product in evolution - you can contribute ideas for templates and get involved in the community on the XerteForTeachers JISC Mail list. You can even submit your own resources to the showcase area on this website and have a look at what other people across the world have been doing.